APRIL 2007 -- Our year of Musical Chairs is marching right along! Have you been “Drumming Up” interest in our State Baking Contest - Musical Bars? This year, you can choose your Favorite Bar Recipe! You will have plenty of time to try a new recipe or perfect an old favorite. Bake them for your Subordinate Run-Off. The winner will represent your Grange at the State Judging which will be held at our “Let’s Celebrate Day” on August 25, 2007 at Good Will Grange Hall., All CWA chairmen received the rules in the CWA packet. 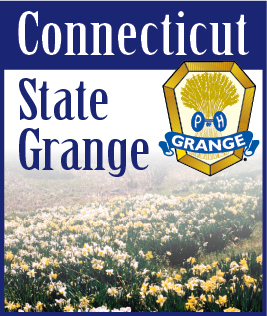 This Baking Contest is sponsored by the State CWA and is open only to Grange members, their children or grandchildren and Junior Grangers. Each Subordinate CWA chairman can choose the method of judging - secure judges, common consent, ballot, etc. All Junior entries will come directly to the State Judging. For State Judging, enter 3 bars on a paper plate. Label with name and Grange and indicate if it is a Jr. entry. Include recipe. Monetary prizes and ribbons will be awarded. Due to refrigeration concerns, the bars must not require refrigeration or perishable toppings. Also, no mixes, unless they are part of the main recipe. Since there should be a nice variety, we hope that you will use the entries for refreshments in your Granges. This year, the State CWA will also be promoting the Lillian Merrill Baking Contest. The recipe is for “Sugarless Cookies” using spices, unsweetened applesauce, oats, nuts and raisins! Sounds delicious! The recipe will be available in the Connecticut Granger, through your Pomona CWA chairman or contact State Ceres, Eloise Osuch. This contest is open to the public with all entries to be judged in conjunction with our “Let’s Celebrate Day!” in August. First prize will be $25, a rosette, and winners’ name inscribed on the trophy. Second prize is $15 and ribbon, third prize $10 and ribbon. We hope that you will get on the bandwagon and enter these fun contests. Not only do you win prizes and ribbons, but you get to enjoy eating the goodies!